This document will become the New and Noteworthy page for the next milestone release and meanwhile serves to document the development progress. All features documented here can be obtained from CVS HEAD. The RWT-API classes now provide Java-Doc comments. These comments are adapted from the SWT library since RWT implements a subset of SWT. The revision of the comments is not completed yet and there may be also some anticipations of implementation details that ment to be available in the 1.0 release. 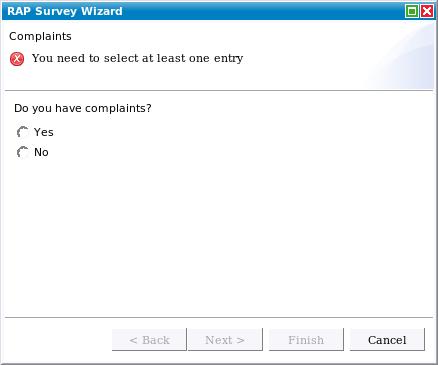 If you find inconsistencies in the docs, please report them to us so that we can resolve them. RWT now supports untyped events. Note that this implementation exists for reuse of JFace and Workbench code only. If you write application code we recommend to use the typed events furthermore. Note also that there is still some work to do and that not all of the untyped event fields already provide meaningful values. In particular the doit flag does not work. You're reading it right - JFace 3.3 is here! This time, we used the complete JFace 3.3 codebase and stripped down the things not working (at the moment). As we can't support everything out of the box, here is a short list of things you can now use in your RAP application besides the already known stuff. There are many more things in the JFace 3.3 codebase - just get it and play around with it. We're open for all bug reports regarding the (new) components. Note that some of the components (like DoubleclickEvent, ViewerFilter or the Wizard framework) are now part of the demo application. Most of them will follow but there is a need for some new infrastructure first. At the moment, you'll find the Java files of the excluded components but they are commented out to avoid confusion using "Organize Imports" or "Open Type". You have now several possibilities to open a new view without initially defining it in your perspective. On the one side, you can use WorkbenchPage#showView("your.view.id") to show the view. All necessary data gets loaded from the server automatically. 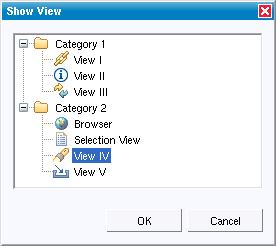 Another way is - like you know it from the Eclipse Workbench - to use the "Show View" menu. To implement it in your RAP application, use ContributionItemFactory.VIEWS_SHORTLIST.create(IWorkbenchWindow); to get a list of all view shortcuts of the current perspective which can be used in a MenuManager. But don't forget to add the commonly used views as shortcuts to your perspective (see IPageLayout#addShowViewShortcut("your.view.id")). For all the views without a shortcut, there is a "Other..." item appended to the end of the list to display the so loved "Show View" dialog where you can browse all available views. HINT: Now you can also categorize your views - just define the category attribute in your view extension. Due to the efforts of making RAP-APIs a subset to RCP-APIs the package org.eclipse.ui.entrypoint has been moved to org.eclipse.ui.application despite the fact that there is no need for implementing IPlatformRunnable as application definition. Please use the organize import functionality of the Eclipse IDE to adjust your existing source code. 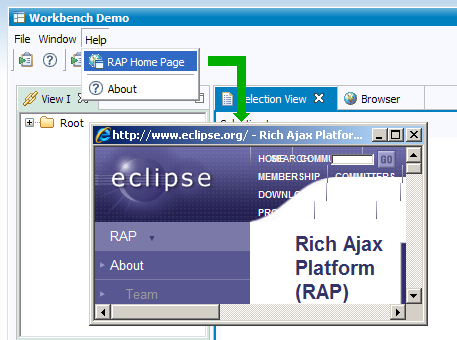 The plug-in org.eclipse.rap.ui.workbench now reexports the basic UI plug-ins that are needed for RAP UI development. This is similar to RCP. The plug-in dependencies are org.eclipse.rap.w4t, org.eclipse.rap.rwt and org.eclipse.rap.jface. The implementation of org.eclipse.ui.IPageLayout has been pursued. It is possible to add standalone views as shown in the code snippet below. The resulting perspective layout with the standalone view on the left hand side can be seen in the screenshot. You can now set specific part informations dynamically at runtime. This includes setPartName, setTitle and setTitleToolTip. Please use setPartName for setting the title of your view because setTitle is deprecated and only implemented for compatibility reasons. setContentDescription and setTitleImage are not yet available. It's now possible to maximize/restore view parts by double-clicking on their corresponding TabItem. The IWorkbenchBrowserSupport and IWebBrowser interfaces along with a default implementation that meets the minimal requirements have been added to the workbench. This allows you to open URLs in a popup window. 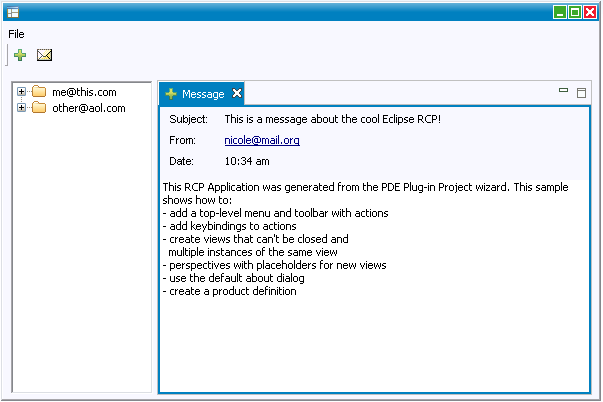 The corresponding extension points org.eclipse.ui.browser.browsers and org.eclipse.ui.browserSupport as provided by RCP are not yet available. To use the local pulldown menu of your view, simply add the actions to the MenuManager of your ViewSite. If there is not enough space left in the TabFolder to show all the view actions, the toolbar is now automatically rearranged to use the full width of the folder. The RAP workbench offers you a new extension point: perspectiveExtensions. With this, you can contribute new views or view shortcuts to existing perspectives across several plugins. The extension point makes it easy to contribute additional views from other plugins to a perspective defined in your core UI plugin.